Red Orchestra 2:Heroes of Stalingrad is Tripwire Interactive's follow up to the cult classic Red Orchestra. Following in the footsteps of its predecessor, RO2 takes us to the Battle of Stalingrad and the back and forth conflict between the Soviet Union and Third Reich. The game, while supporting a single player mode, is very much intended as a multiplayer experience. With that in mind, this article will focus on the multiplayer mode. If, however you are new to RO2, I would suggest at least trying the singleplayer as it does give a good introduction to the game and it's features. Red Orchestra 2 has three game modes currently: Firefight, Territories, and Countdown. A fourth mode will be released at a later date. Firefight is RO2's version of team death match, and is much like it is in other games, as both sides battle it out till the tickets run out. Territories is similar to Project Reality's Advance and Secure modes. Both teams have set areas they need to attack and then hold onto. These territories follow a set order they have to be taken in, however its not uncommon to have to take a set of territories before the next set comes into play. There is also a variation of the standard mode were one side attacks and the other defends. In this mode, once the attacking team moves past a captured territory, that territory is out of play. For the most part, the territories are huge, allowing for many avenues of attack and defense. Some territories are just a single, small building, others are multiple buildings or large, open areas. Taking a territory is accomplished simply by having more people in the area then the other team. This game mechanic allows for some serious tug of war scenerios on a territory, where each team is trying to get more soldiers in the capture radius and eliminating the enemies. There is also a Tank Mode, where there are no infantry, only tanks. We will discuss the tanks in more detail later in this article. Countdown is Tripwire's interesting take on single life game modes, similar to Search and Destroy in Call of Duty. In this mode, one team defends a set of objectives with only one objective in play at a time. The other team attempts to capture that objective. If you happen to be killed during your assault or defense of an objective, you are treated to spectator mode until that objective is successfully captured or defended. Once the attacking team captures a point or eliminates all enemies, a new round is started, everyone respawns and the next objective is in play. If the defenders repel the attack or eliminate the other team, the teams switch sides. The great thing about this game mode is that it generally slows the game play down and forces the player to be more careful. But, if you are killed, you only have to wait a few minutes before getting back in the action. The tanks in RO2 are both interesting and frustrating. On the one hand, they are beautifully modelled with a complete 3D interior, where you can see the rest of the tank crew and interact with the various peep holes, optics and vision slits. A player can also switch positions in the tank and is treated to a well done animation of the character moving from one spot to the next. Another cool feature of the 3D modelled interior is that you can watch as members of your crew are killed and/or gibbed, by a well placed enemy round. The tanks also have "realistic" damage models. Meaning, you need to carefully place your shots, whether using an anti-tank rifle or a main tank gun, it is imperitive to aim carefully to maximize the effects of a hit. However, as cool and impressive as all of that is, the tank combat is lackluster at best. The main stumbling blocks are: the lack of a dedicated voice channel for the vehicle and the inability to quickly see who's in the tank with you. These two problems severly limit the ability of a tank crew to coordinate and makes tanking a chore. The final nail in the coffin for tanks is the AI crew members. In the tank-only map, Gunrak, the AI crew members are virtually worthless. But, in the combined arms maps, the AI crew members are able to see through smoke and are serious "aim-botters". All a player has to do in order to rack up alot of kills, is drive the tank to a posistion that covers an enemy route and let the AI coax machine gunner one-shot any visible enemy. If TWI fixes the communication and coordination problems, and fixes or removes the AI crew members, tanking in RO2 could be fun. We shall have to wait and see. Infantry combat, on the other hand, is very fluid and realistic feeling. 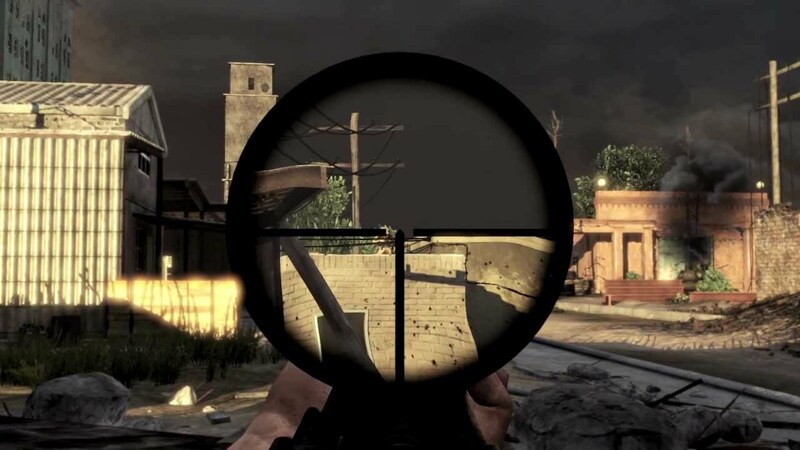 The player is able to perform actions that aren't seen in many modern FPS games, such as: prone, lean, mantling obstacles, running crouched and deploying machine guns. The first person cover system is done well and is a usable feature. It allows the player to duck behind most objects and then peak over and fire. You can also blind fire your weapon while in cover. With RO2 being a first person shooter, this is the only game were it's actually "blind fire". The few problems with infantry are mostly limited to a contextual "use" key and the default keyboard bindings. This key combines move into cover, bandage, and use. This can be frustrating when you are attempting to bandage a wound and instead, move into cover. For quite a few players, the default keyboard bindings make little sense and the player is forced to rebind many keys. Maps in Red Orchestra are, for the most part, balanced, fun and well detailed. The stock maps are also as historically accurate as TWI could make them. Players can fight anywhere from the heart of Stalingrad in Fallen Fighters, to some of the outlying areas in Spartanovka and Grain Elevator. Most of the maps are in urban areas, but this is Stalingrad, not some random farm land. The game shipped with a total of 10 maps, one tanks only map (Gumrak), four combined arms maps (Commissar's House, Fallen Fighters, Pavlov's House, and Red October Factory), and five infantry only maps (Apartments, Barracks, Grain Elevator, Spartanovka, and Station. The really exciting part is that TWI will be releasing mapping tools in the near future and we will be able to anticipate a plethora of community made maps.. for free! One minor sticking point right now is the Protected Area system. Depending on the map or in certain cases, the territories that are in play, part of the map will be off limits to the player. The problem is that these Protected Areas areas are not marked on the map and if a territory switches hands, you will have approximately two seconds to egress from the Protected area, or die. The only warning you get is a text message that appears in the middle of the screen, that only seems to appear about half a second before you are killed for being out of bounds. On the other hand, the Protected Area system does an admirable job of preventing most spawn camping issues. The maps are quite large, but not so huge as to require soldiers to run for days to get back in the action. There is also a dynamic map size, based on the maximum player count of the server. There are versions for 16, 32, and 64 player servers. There are several different roles that a player can choose from in this game. Each role has a pretty specific purpose and most require a different set of skills to excel at. Here is a list of the different roles, what weaponry each carries, and some commentary on what the role is best used for. All roles have access to a pistol and some type of grenade. Rifleman: These are the common, front line foot soldiers. They are equipped with a bolt action rifle. Riflemen excel at medium to long range encounters because of the accuracy and lethality of their bolt action rifles. The slow rate of fire of their rifles makes them a difficult role to survive with in CQC. Assault: These soldiers are best used for close quarters combat, seeing as they are equipped with a submachine gun. They also have access to a pistol and fragmentation grenade. Medium range encounters are not too difficult for this role, as long as the player is able to fire in short, controlled bursts. Elite Rifleman: These riflemen can carry either a bolt action rifles or a semi-automatic rifle. They are the most versatile role in the game, outside of the command classes, and can easily be used for any range of encounter depending on the weapon they select. Machine Gunner: Obviously, this role is equipped with a man portable light machine gun. This role is, arguably, one of the more difficult to master. The weapons perform admirably and easily mow down enemies at any range. The difficulty with this role is not weapon control as much as finding a good place to set up. One thing that is noteworthy about this role is that the barrel of the MG can overheat and can be replaced in the field. In some cases, the machine gunner can act as a spawn point for his fireteam. Marksman: The marksman carries a scoped rifle into combat and is the king of long range engagements. For medium to short range encounters, the marksman can alternate between his scope and the iron sights of the weapon. Anti-Tank Soldier: Since there were no (or very few) Panzerfaust's or Bazooka's in the battles of Stalingrad, they have not been included in the game. Instead, the AT soldiers use an anti-tank rifle that is very accurate and used to fire at the weakest parts of the enemy tank. It is accurate enough to shoot out a tank crewman through their viewport. They are also equipped with AT grenades, which are very destructive to enemy armor. With the way AI tank crew members can instantly spot and engage enemies, this class can be exceedingly difficult to play successfully. The AT soldier should focus on getting behind or on the flanks of an enemy tank before engaging. Engineer: This role carries a SMG into combat along with satchel charges and AT grenades. The satchel charges can be used by the engineer to open new access points into buildings, basically making them a sapper. Squad Leader: The squad leader can choose between a submachine gun or a semi-automatic rifle. In addition, they carry a smoke grenade and a pair of binoculars. Smoke grenades are extremely useful and are almost required for a successful assault or retreat. The binoculars allow the SL to see detail at range as well as marking artillery targets for the Commander. The squad leader is also able to issue attack and defender orders (via a commo-rose interface called the Command Widget) to his squad as a whole, or different orders to the three fireteams under his command. Lastly, the SL can act as a spawn point for his squad. There is an issue currently with sometimes not being able to spawn on your SL. TWI is looking into this. Commander: The commander has the same weapon choices as the squad leader role. The one difference is that he gets two smoke grenades, instead of one. The Commander role also has access to the command radios that are scattered thoughout each map. The radios allow the commander to call in aerial recon planes that spot enemies outside of buildings, force dead teammates to respawn, and to call in several different types of artillery (artillery barrage, mortars, and rockets) that have different tactical uses. Lastly, the commander can issues orders to the squad leaders through the same interface that the SL's use. Generally speaking, the weapons are balanced fairly well between the teams. But, because so many classes have access to SMG's and semi-automatic rifles, there are not as many simple riflemen as you would realisticly expect to see in the battle of Stalingrad. This causes a bit of an imbalance when you consider that most of the maps are CQC heavy. RO2 is a game that requires teamwork and communication to achieve the objectives. The team that is better able to communicate and coordinate generally wins. Tripwire has made sure that the in-game VoIP works flawlessly and have included three separate channels: Squad, Team, and All. In addition to the in-game VoIP, players also have access to the Communication Widget. This allows a player to call for more ammo, ask for reinforcements, use of Commander assets, and other teamwork oriented call-outs. As stated before, the Squad leaders and Commander can use the Command Widget to issue attack and defend orders, mark artillery targets, and other useful commands. Along with all of that, every player has access to what is called the Tactical View. With one keystroke, a player can see where the objectives are, where his SL wants them to be, where the SL is at, among other useful information. RO2 has a plethora of features built in to satisfy many different tastes. For example, your soldier gains Honor as he completes objectives, kills enemy soldiers, etc. Honor is used to rank up your soldier and unlock items, weapons, and stat increases, making higher ranked players quite formiddible but, not impossible to defeat. Overall, RO2 is a very well done tactical shooter. It's a solid FPS experience with great options for teamwork. While being a "tactical" game it’s a nice midway between Armed Assualt and Call of Duty, allowing players to either play with a "low and slow" or a "run 'n gun" mentality. While the game still has a few issues and bugs, none of them is game breaking. Even with these issues TWI seems very intrested and eager to fix these issues. Since release, there have been several patches already, with more coming down the pipe. TWI has also planned continued support (as they do with all of their titles) and FREE DLC for the game. They have also stated that they will be releasing map and mod tools. Several teams of modders have already been issued the tools and are in the process of making professionally done mods. A couple that are noteworthy are Rising Storm, a mod about the Pacific Theatre in WWII, and In Country: Vietnam. In closing, if you consider yourself to be a tactically minded FPS player, you'd be crazy to not buy this title that's been developed exclusively for the PC. Editor's Note: Mindkill and I would like to extend our thanks to JohnFlenaly for his superb help in preparing this article. Some would say (and have said) that I'm a "FPS whore" and with over 100 titles on my principle gaming rig you could make that argument. I will say without reservation that RO2 is the best. It has ALL the features we as gamers have been asking for in a tactical shooter and seems to have been built with the TG audience in mind. From squad layouts to comms, lean to blind fire, graphics and depth of field, it rates as the best (now maybe I can quit looking). Some will undoubtedly still pass because it's based on the Siege of Stalingrad which makes it a WW2 shooter but it still maintains an edge of fantasy that I require in a game. Not to worry, the release of MOD tools to the community will insure that you'll see mods for Vietnam and other factions that I believe will hold a following as long as Counter Strike. As we learn the game and squads spend time in game together, the level of play will continue to advance so the sooner a new player starts, the shorter the learning curve will be. It's not a run-n-gun shooter but it still maintains a place for such tactics in room clearing and it rewards the low and slow as well. Staying on objective and working together is rewarded in the game mechanics more than kills so even if you're not the best twitch shooter you'll still be able to excel with this game (I know because nobody would ever confuse me with being a good shot). I could go on and on but for now - "Nuff said". Staying on objective and working together is rewarded in the game mechanics more than kills so even if you're not the best twitch shooter you'll still be able to excel with this game (I know because nobody would ever confuse me with being a good shot). ^^This. There have been many times, as a squad leader, that I have racked up an unimpressive 2 or 3 kills and topped the scoreboard. Performing actions such as killing an enemy net you 1 point. Killing an enemy while you are on an objective and the enemy is not, is an additional 2 team points. You also get additional team points for defending your commander or SL. RO2 is one of the few games out that actually rewards playing the objectives and playing as a team over kill-whoring. It doesn't take long at all to "stop sucking". If you're good at FPS games, you will still be good in RO2. What takes some time to learn are all of the different game mechanics. A good way to get a head start is by playing the single player campaign, it's basically the manual for the game. Because you and I haven't gamed together (as far as I'm aware), I couldn't say if this would satisfy your gaming needs. All I can really say is this: RO2 has very good teamwork tools and when they are used, the game play is very immersive and I find it extremely fun. Cheers dude, I'll look into this.